Today, a successful project in the mining industry often relies on the support and active participation of an indigenous partner. Partnerships with indigenous communities not only exist with the mine owner but often involve any party performing work on the project. One such partner, Cementation Canada, has a long history of successful indigenous partnerships for many of its past and current projects. The Vale Totten mine reactivation project. These stretch from Nunavut in the Far North, to Ontario and the James Bay territory in Quebec, and to the Labrador region in eastern Canada. Successful partnerships with local communities must be founded and built on trust and respect. Cementation views these partnerships as long term relationships which align with its mission of being the contractor of choice through excellence in all aspects of any project we undertake and in doing so building long term relationships. Training Services, Matawa First Nations. Any partnership with an indigenous community should exist well after the project is completed. Cementation develops local community partnerships that are built on experience and lessons learned. And probably most important is the element where these partnerships must be culture based and both partners have an understanding of each other’s culture that will help make the partnership and project successful. For most mining projects within the industry there is an existing form of partnership, either some form of IBA (impacts benefit agreement) or collaboration agreement with the local indigenous community and the mine owner. These agreements are usually in place before third parties are contracted. The aim of any partnership that Cementation develops with the community is one that will support aspects of the existing agreement between the community and the mine owner. It is often the company’s partnership with the community that allows the community and its members to gain benefits from the project work carried out. For example the mine owner may have an element of employment and training in their agreement with the community, but most often the training and employment opportunities are first realized through the partnership between Cementation and the local community. Cementation has 12 years of successful indigenous partnerships in Canada. The most significant and longest is Kitikmeot Cementation Mining & Development Ltd. (KCMD), an Inuit firm based out of Cambridge Bay, NT. KCMD was established in 2005 as a joint venture partner the ship between Cementation Canada and Kitikmeot Corporation for work that is carried out in the Kitikmeot region of Nunavut and the Northwest Territories. KCMD has been engaged at the Diavik diamond mine in the Northwest Territories, since 2005. KCMD also provides underground mine development and construction services to TMAC Resources at the Hope Bay gold project in Nunavut. Successful partnerships realize the most opportunities for the community and their members and businesses. Too often mining projects once approved are accelerated into the project execution phase and there are missed opportunities for the local community. Cementation bases its partnerships on some guiding objectives. For example, a successful and beneficial partnership must have an element of labor force training. To be successful, this training aspect must be a part of the overall project execution plan and discussed early before the project moves into execution. This ultimately provides benefit to the mine owner at the end of a project when the mine owner takes over the project as an operating mine. Labor force training provides career opportunities for the local indigenous community and its people. It also provides a source of labor for our projects through the local and surrounding communities. Cementation has successfully implemented and delivered its New Miner Training Program to numerous community members across many of its mining projects over the last ten years. 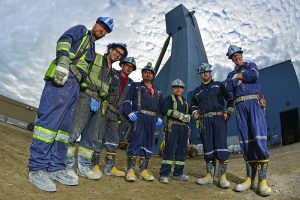 One such example of a successful New Miner Training Program with local community members is the recent Totten mine reactivation project that Cementation carried out for Vale in Worthington, ON. The project, located on the lands of the Sagamok Anishnawbek First Nation, commenced in 2007 and the mine officially re-opened in early 2014. 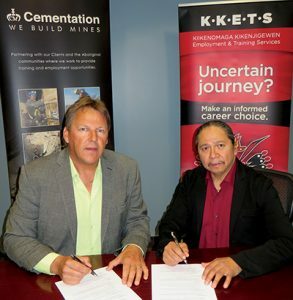 Cementation established a working relationship agreement with the Sagamok community that focused on new miner training. During the different phases of the project, Cementation trained 38 community members through the New Miner Training Program. The program consists of both a classroom and underground awareness session followed by placement on the project into an entry level position where the trainees begin to develop their skill sets. Today, many of the new miners that were trained from the Sagamok community remain employed with Vale at their operating mines, including Totten. Perhaps one of the most significant changes Cementation carried out before commencing the training for local community members was to move the three to four week classroom training into the community. Cementation also worked with the community to jointly select the training applicants which helped make the program 100% successful. The program is based on a 12 module program delivered in the classroom followed by the underground awareness training that gives each trainee the minimum accreditation to commence work underground. After 12 months of skills training, many trainees moved from entry level or support positions to direct face mining crews. Several participants were even successful at enrollment and obtaining an industrial electrical trade through Cementation’s apprenticeship program. For any partnership to be successful, it should have the following objectives: 1 It needs to maximize employment opportunities for community members and incorporate other joint venture or partnering opportunities for goods and services from local indigenous community companies or providers. This gives opportunity for the general partner to “unbundle” some of the project scope to the local community businesses. Employment and training programs for local community people will increase capacity and provide career opportunities for its people. 2 The partnerships have to expand the knowledge, understanding and awareness of mining within the community and in doing so encourage young people to consider mining as a career option or pursue an education that will benefit them in the mining sector. 3 Any partnership has to be fair for both parties. Any revenue or profit sharing model through the partnership has to consider the partner who carries the risk. The framework for any partnering agreement should also be indicative of the contract style between the mine owner and the service provider partnering with the local community. The partnerships must be competitive and fully transparent to both partners. The partnership should align with the overall project goals in executing an injury free project on time and on budget. Cementation works closely with each local indigenous community to maximize their benefits and opportunities and the mine owner to deliver a successful project while maximizing local content. Eric Kohtakangas is VP operations at Cementation Canada Inc.